There is a huge time for suspense for everyone in the Microsoft Data Platform space, whenever its time to submit sessions for the PASS Summit and even more, when the notification of the selection/non-selection are being sent to those who submitted sessions. Even in this year (where I am planning to do just 5 conferences, since I am focusing on what matters more than anything – my family), I was anxious to find out if I was selected or not. 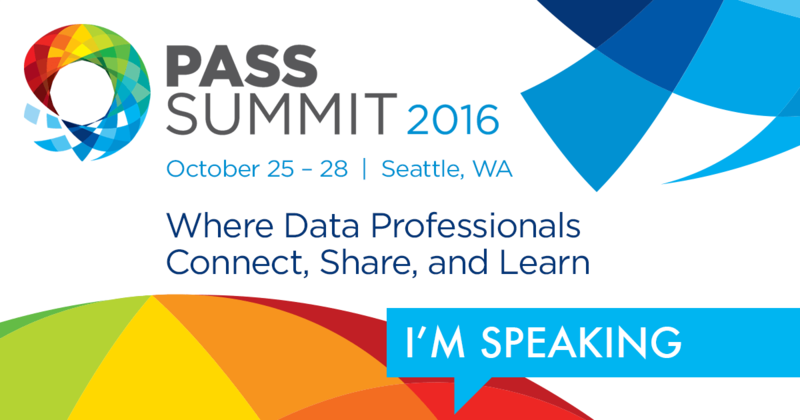 A couple of days ago, the wait was over – I have received exciting news for the 3rd time in a row, that my session session “Columnstore Technology Improvements in SQL Server 2016” was selected for the official program of the PASS Summit 2016. I can’t underestimate how much it means for me – especially this year when I will not be doing the same amount of speaking that I did in the previous years. I am very grateful that the committee and the volunteers thought that my contribution will be valuable for the Microsoft Data Platform audience. During the summer I will be working on my session to make it count. As for my own session – consider appearing, since I will dive in some of the less known specifics of the SQL Server 2016 Columnstore implementation – a good example of some small things is the last blog post on Columnstore Indexes – part 85 (“Important Batch Mode Changes in SQL Server 2016”).